There’s nothing like the urgency you get from World War Two films made during that conflict. Imagine how they played to audiences still in doubt as to its outcome. Whatever tension was generated on screen was redoubled by real-life anxiety over who’d win or lose. Were the likes of Flying Tigers and Across The Pacific there as much for reassurance as escape? Looking back from our comfortable distance makes it easy to wax superior over cliches and wrong then and wrong now attitudes, but how many films since have confronted such an imperative, with the very survival of democracy hanging in the balance? I’d have sure looked to Bogart and John Wayne as counterweights to headlines appearing in 1942, a year mostly bleak for the Allies. Theatres were a refuge that promised ultimate victory with a necessary caution that getting there would be rough and demand sacrifice. Unlike dreamscapes of the thirties, wartime movie houses were recruitment and basic training sites for home-fronters anxious (or not) to do their civilian part. 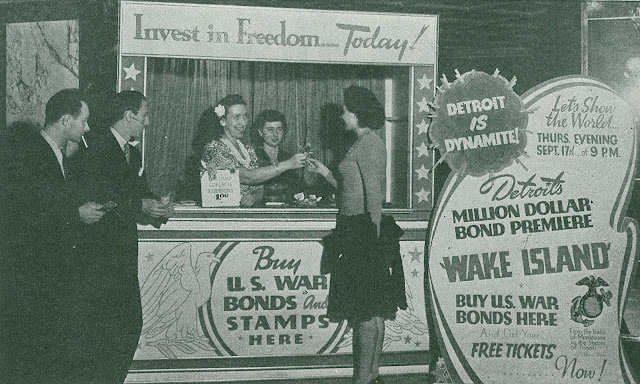 You ran a gauntlet of war bond selling booths positioned in most lobbies. Kids rolled discarded tires to scrap drives showmen sponsored. There was no more prominent community center than a theatre in small towns, and no experience so intense as moviegoing with stakes this high. Content of newsreels was trumpeted in newspaper ads. Captured Jap Footage or Fall Of Corregidor were as much lures as features, even double ones. It was vital in early days of war to give the impression we were whipping the Japanese even as they were actually creaming us. For whatever pleasures are had watching Flying Tigers and Across The Pacific, it’s all so much quicksilver compared with excitement and encouragement they provided to 1942 patrons far more in need of it than we’ll (hopefully) ever be. Calendars are the stuff of high drama in both Flying Tigers and Across The Pacific. A date shown close-up assured gasps of recognition and grim foreknowledge of dreadful things about to happen. Timeliness was advantage for war stories. Set the action in months just previous and features became an extension of newsreels preceding them, a kind of seamless narrative lots more realistic than movies had been before. Flying Tigers was shot during May-July 1942 and released in October. It told of Americans volunteering to help the Chinese rout Japanese oppressors in the air. Their war become ours when a third act set-piece shows John Wayne and others listening to President Roosevelt declare war just after Pearl Harbor. Action stops for this and we linger over troubled expressions as the speech is heard in its near-entirety. I’m betting very little popcorn went into mouths as the President spoke and Wayne reacted. 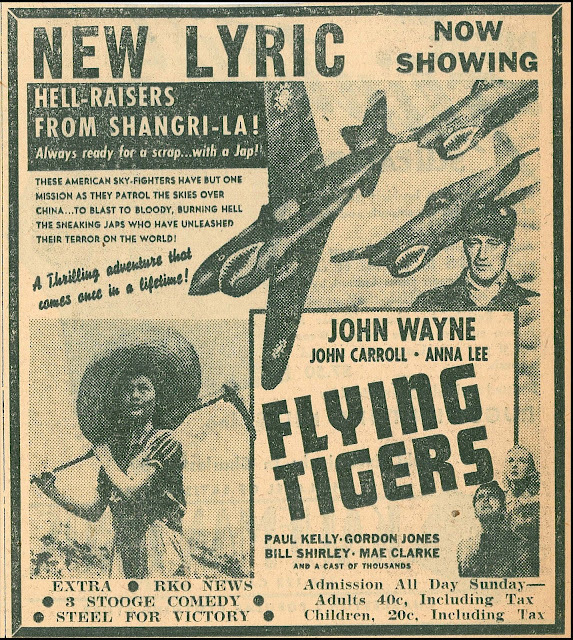 Flying Tigers was barely rejiggered from aerial dramas Howard Hawks (Only Angels Have Wings and Ceiling Zero) and others had done, though they lacked blood-quickening propaganda values furnished by a real-life war. Familiar narrative devices of reckless pilots and cowardice aloft were buttressed by opponents foreign, sinister, and since Pearl Harbor, easy to hate. Never had the "other" exhibited such otherness. Japanese pilots in Flying Tigers are subhuman and lethal. They wear caps with mangy fur linings. When shot down (often), they clutch throats and upchuck blood (imagine post-December 7 cheering at that!). 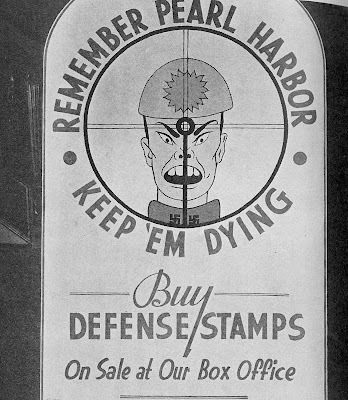 Ads shown here are first-run and mince few words as to Flying Tigers’ propaganda mission --- To Blast to Bloody, Burning Hell The Sneaking Japs Who Unleashed Their Terror On The World. Patrons might indeed have benefited by issuance of Valium tablets with their concessions for appeals so forceful as this! 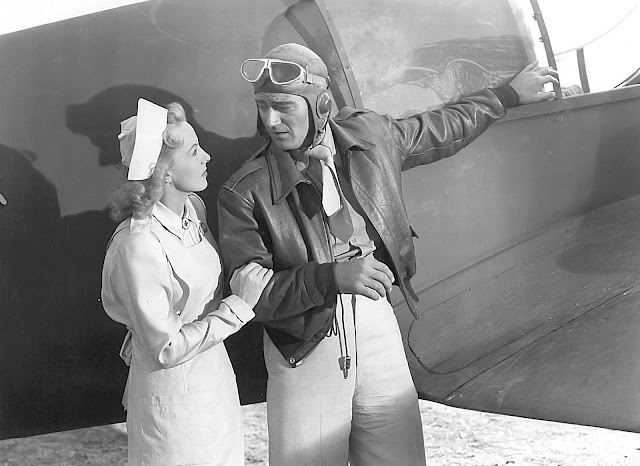 Flying Tigers was the only feature in 1942’s top twenty not produced by a major studio. Small-timer Republic had never had product so grand, or timely, as this to sell. Budget was set at $264,384, but negative costs ran to $397,690. 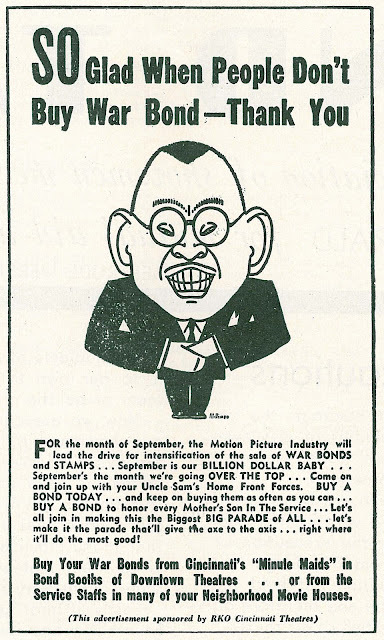 The company accustomed to flat rates for its westerns and serials now demanded 35% for Flying Tigers. They’d not have gotten such terms but for John Wayne, now a bonafide "A" star and bound by a Republic contract. You can look at this show and those he did before it and know that Wayne’s essential screen character was born in Flying Tigers. He’s fully formed at last after years in rough draft. No longer the uncertain youth of Stagecoach and Seven Sinners, but a leader of men and warrior of unquestioned judgment. Wayne from this point would remain the sober alternative to recruits brash and green, exemplified in Flying Tigers by John Carroll as go-it-alone hotshot pilot based on the old Cagney model discredited now in a war demanding team effort. To be exemplary in battle meant pitching in for the good of all. One-man bands played mostly in graveyards. Wayne was fortunate for age advantage promoting him to onscreen officer status and roles better suited to underplaying he was best at. It’s efforts of a John Carroll, all smirk and acrobatic eyebrows, that emphasize Wayne’s cooler hand and firmer grip on his audience. As an actor, he could finally benefit for doing less. While Wayne developed his soundstage combatant, eager players like Carroll and James Craig over at MGM followed examples soon to be outmoded, patterning themselves on Clark Gable, the latter service-bound as were many pre-war first-teamers. Wayne knew his career turned upon opportunities he might seize while these rivals served. The decision to stay out of the war probably spared him the afterward fate of many who’d enlisted short of firming up stardom. Across The Pacific, if not heralding the arrival of Humphrey Bogart as romantic leading man, at least gave him recognition as such after years of varied service to criminal enterprise and "B" leads onscreen. Jack Warner saw ATP and wired home that his studio finally had its own Clark Gable in Bogart, little realizing that his asset was one of greater longevity than he’d suspect. 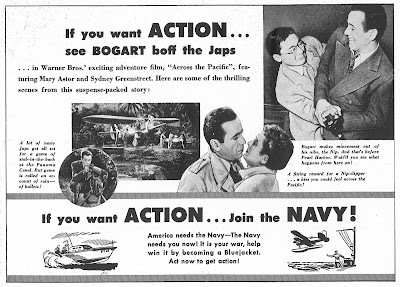 Bogart was like Wayne in shaping a hero for the war that would sustain beyond its conclusion and help redefine masculine codes for a generation to come. He’s more believable for being less fully committed than others who lay down sacrifice without question. Bogart cashiered from the service seems not an unlikely premise. His turning out to be working undercover is frankly less plausible. Despite the several war-themed films they did together, Bogart and Sydney Greenstreet’s characters seem always to function as men without countries, at most figures without loyalty except to themselves. 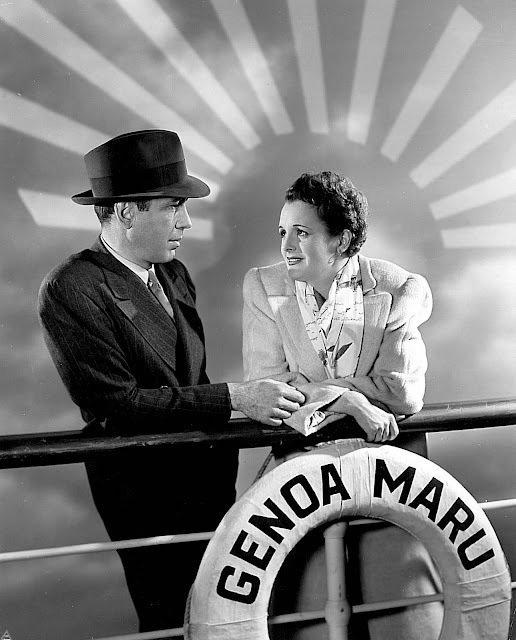 The template established by The Maltese Falcon died hard, but the conversion of self-server Bogart to an Allied calling made hits like Casablanca possible. 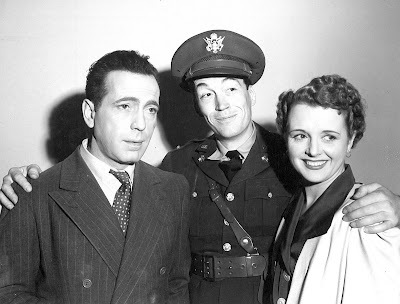 His patriotic fervor seemed more an informed choice than those of guileless leading men suiting up at the bugle’s first call, but again, it was Bogart’s age and presumed maturity that made his character’s choices more reasoned ones. 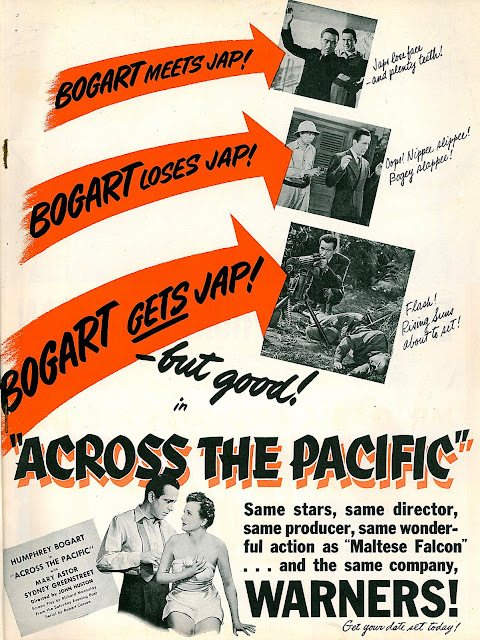 Across The Pacific combines that equivocation with a playful undermining of the straightforward Know Your Enemy message put forth by Flying Tigers and simpler-minded Jap-slappers. 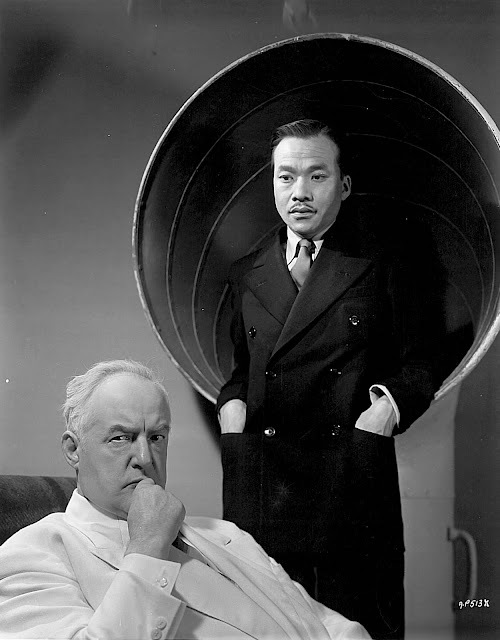 Here we have Sydney Greenstreet as jovial, if untrustworthy, proponent of oriental culture given legitimacy by his appreciation of it. A judo exhibition in Across The Pacific amounts to endorsement of that art as superior to defense tactics of our own. For all the film’s recognition of a cunning and formidable enemy, Across the Pacific’s promotion relied on Yellow Peril devices and a by-now familiar revenge theme (I’ve Been Hoarding This Sock Since December 7, says Bogart in poster art). Its September release brought domestic rentals of $1.3 million against negative costs of $576,000, with foreign an additional $994,000. Final profits of $1.1 million were the largest yet for a Bogart vehicle. You know John, another WWII propaganda film which has just disappeared for over 40 years is Monogram's "China's Little Devils." Having grown up in L.A. I used to watch it on TV, then it suddenly vanished....However, TCM has a synopsis of it on their website, which gives me hope that it might show up on that channel one day. It had an impressive cast (Harry Carey and Paul Kelly) and a musical score by Dimitri Tiomkin (!) Being a Monogram picture it would seem as if Warners would now own it......This is a film which should be re-discovered. James, I'd heard of "China's Little Devils", but never saw it, and had no idea that it had a Tiomkin score. Like you, I assume Warners owns the negative. Anyone know for sure? By the time I was 12, I'd learned more about World War II from movies like these -- and the 3 Stooges shorts, for that matter -- than my daughter has in school. And she's in 7th grade. Can anyone imagine seeing a "Remember 9/11 - Keep 'Em Dying" poster at the local multiplex? 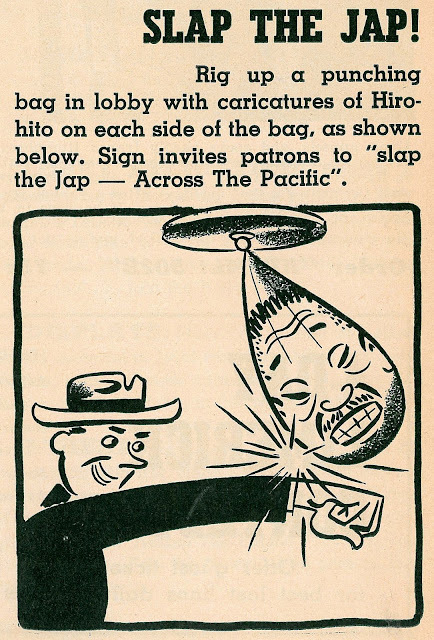 It's troubling to think that all that "Sink the Jap" propaganda nourished the country's will to win. Is the lack of the same tactic today the reason why most of the nation lost its stomach for the current battle after the first year? Do we REQUIRE such propaganda to win a war? I hope not. My father-in-law, who passed away in July, was Japanese-American. He grew up in California of a family of farmers, and during the war they were all packed off to an internment camp. He was never bitter about it. As an adult, he worked for the government that put him in that camp, and he was a committed conservative for as long as I knew him (which isn't to say he didn't question the stupidity of some of our leaders, because he sure did). Knowing him was a great education for me: just because self-styled "experts" tell us that certain events in our history were tragic, humiliating and unconscionable doesn't mean that the people who lived through them will agree.